● Two independent sources phase-locked to the same internal or external reference. ● USB and TLL Serial Interface. ● Intuitive GUI or simple ASCI command from any terminal program. 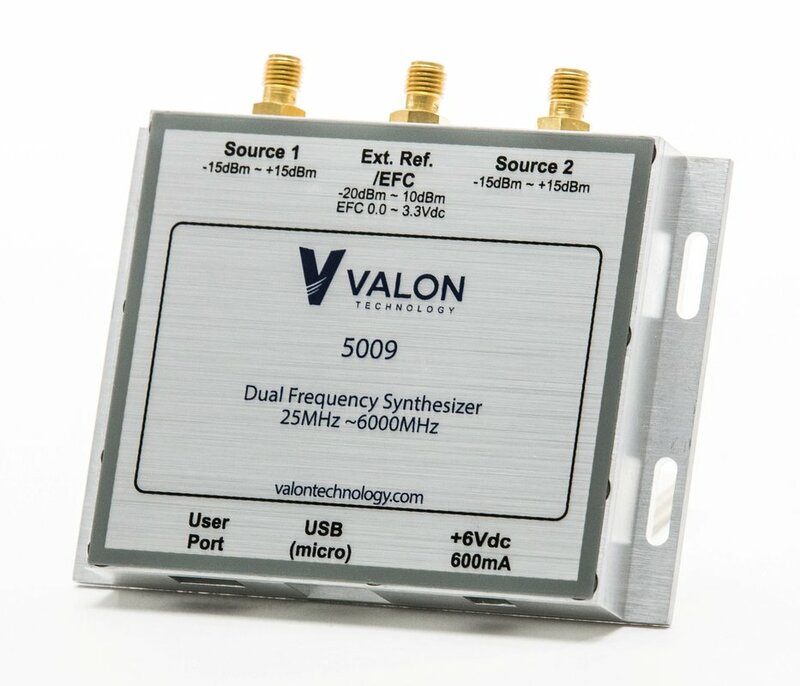 The Valon 5009 frequency range is 23MHz to 6000MHz. The output power is increased to +15dBm and can be adjusted in 0.5dB steps with 31.5dB step attenuator. ● Simple human readable command based interface with menu. Use any terminal program. ● USB or TTL serial interface. TTL interface allows simple user hardware integration. ● ±2ppm analog TCXO, external reference input 10 – 200 MHz. ● FLASH based non-volatile memory. New in the 5009 is an ARM 32-bit Cortextm M3 processor. The synthesizer can now be command-line driven and any terminal program can be used to control the synthesizers. Simple human readable text commands can be used to set all the functions. The GUI is still be available as a free download but it is not essential to the operation of the synthesizer. The embedded firmware upgrades and new features will be downloadable from our website as they become available. There is also an additional TTL serial port that allows for direct machine-to-machine hardware interfacing; bypassing the USB port altogether. You can connect the 5009 using the TTL port directly to your embedded controller without the need for any USB drivers. Sweep mode - The 5009 is capable of fast sweep modes. The user simply sets the start and stop points, number of steps, and the sweep rate. Sweep can be triggered by a command through either serial port or an external hardware trigger input. Single sweep and continuous sweep modes are selectable. Sweep progress can be monitored by the sweep step pulse and sweep enabled hardware signals. List mode - A new "List" mode is included. List mode is similar to having radio-button presets. You can save up to 16 synthesizer frequency configurations which can be recalled using logic signals on the convenient user port. After you set and save your frequencies in list mode you no longer need a controller or computer to select any of the presets specified in List mode. All new updates can easily be loaded onto the synthesizer through the serial port using our code loader software. You will never need to return the synthesizer for firmware upgrades or changes. Many of our early 5009 adopters have been quite satisfied with our command based programming using the terminal program. But the GUI makes it much easier to navigate through all the 5009's useful features. Download the GUI (see below) for free and check it out. You don’t need to have a synthesizer connected to explore all the features. Need a 6Vdc Power Supply? Check out our PS6V-1 Power Supply Kit or UPS6V-2 Battery Supply and Charger in our Accessories page. All our products are designed and manufactured in California.